Aziz Ansari's Live at Madison Square Garden was performed in front of "12,000 predominantly white people." Any time that a standup comedian can sell out a venue of this size, it's impressive and commendable. Having said that, Live at Madison Square Garden is perhaps cleverer in conception but weaker in execution than Ansari's previous specials. Ansari's style of taking serious issues such as racism or the meat industry and bringing them to absurd conclusions is still intact in this special, but it lacks the punch these jokes have had in previous routines. This is due to the decreased use of callbacks and act-outs and greater reliance on comparison, such as: the struggles of immigrants versus the struggles of their children, vegetables versus the meat industry, men versus women, and being single versus being a couple. While these comparisons are true, and somewhat funny, they're also things that people are already aware of on some level and therefore aren't as impactful when the joke's focus is primarily on pointing them out. For example, Ansari's bit about creepy dudes applies the harassment that women face to men. Although the argument of the joke is sound, and his support of women in this way is something many women appreciate (myself included), the material is more likely to make you think "that's clever" or "that's true" or "that's funny" and less likely to make you laugh. Then again, perhaps that reaction is limited to women who have experienced the things he is addressing; it's hard to laugh when you're thinking, "That's true. I should be extra careful when I'm outside." This special also overuses the repetition of phrases, like when Ansari presents the graphs of being single versus being in a relationship. Repetition works well in busy comedy clubs or bars where the audience is distracted, but in a setting where the comedian has the audience's undivided attention, such as a special, it can be grating. 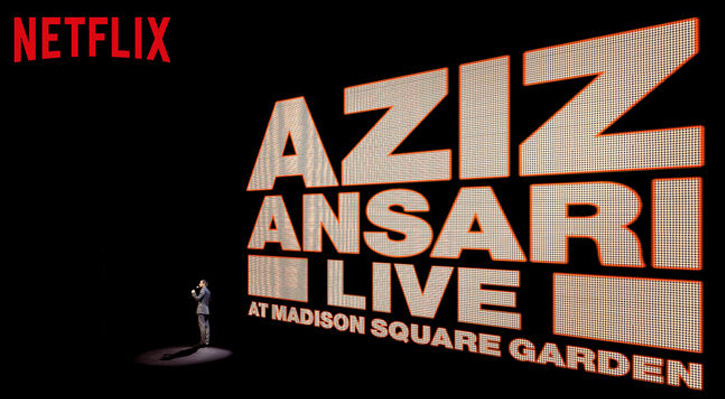 While Live at Madison Square Garden has a few solid moments, it almost seems like the purpose of this special was developing the ideas that Ansari planned to use as the foundation of the first season of Master of None rather than a fully-formed standup special. If you haven't watched Ansari's standup before, start with Dangerously Delicious or Buried Alive. If you're already a fan, you'll probably appreciate this special for how it relates to Master of None.